We wrap up June with our 30th episode, from November 2007 it’s “Freedom Of Choice Shirt.” This episode features music from Mark Bates, The VooDoo Katz and John Radcliff. You’ll also get to see the first appearance of The Android Family. Our animation is a little tribute I created for Jennifer Ziegler in the hours after I learned of her death. This show was dedicated to the memory of Jen and Derrick Kirk, the late Sax player for The VooDoo Katz. You can read the original productionn notes here. The Drive To 75 will continue to run here in PopCult until our big third anniversary show, number 75, which should go online next Monday. Check back every day for more crunchy RFC swellness. You’ll also get to hear a bit of Whistlepunk doing “Lost” during the end credits. We shot the host segments for this show at a costume party at Capitol Roasters where Whistlepunk was playing. There’s also nightmarish animation and a vintage commercial for Shrunken Heads…for kids! You’ll get to see many regular guests and friends of RFC in the show, all dressed up in Halloweenie goodness. Read the production notes, here. And look at a photo essay of the party here. 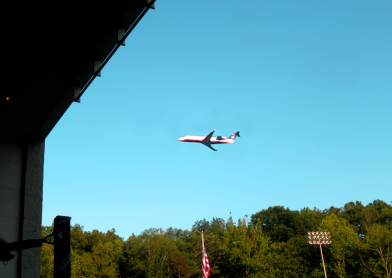 Today’s Monday Morning Art is a slightly digitally assaulted photograph of a plane flying over Coonskin Park last Wednesday evening, taken while I was ringside in the Schoenbaum Amphitheater shell for the IWA East Coast show. Click to enlarge. Later tonight, check PopCult for our next “Drive To 75” classic episode of RFC, plus, if we get the glitches worked out, more FestivAll photos, including the nine that we couldn’t get to upload last Friday. In October 2007, in honor of John Lennon’s birthday, we presented our tribute to The Beatles, “John Lennon Shirt.” This episode of Radio Free Charleston featured Seven Minutes Til Midnight performing “Hey John I Did Imagine,” recorded live at LiveMix Studio, and the animated video for Go Van Gogh’s “Requiem For Pepperland,” crafted by me in four days, and featuring the Yellow Flying Buick Roadmaster. We also have some straight talk from Sir Paul McCartney about drugs, and if you don’t blink, the on-screen debut of our official barista, Chelsea Cook. Original production notes are here. Check back late tomorrow night for our 2007 Halloween show, shot at Capitol Roasters, with music from Big Money and Lil Guy from South Park Enterprises. Today’s classic RFC is one of the “missing” files. Actually, “misplaced” is more accurate. Episode 15, “Black And White” features music from The Appalachian Celtic Consort and The HeyDays (Douglas Imbrogno and Paul Calicoat) plus very short animation by Frank Panucci. This was one of those shows that we cut Pentagram Flowerbox out of. Trivia notes for this show: Both musical performances were recorded in 2006. In fact, “I Never Slept With Alan Ginsberg” was the very first video that I edited for RFC. We sat on it for a few months for some reason. In the early episodes of Radio Free Charleston, the music videos were either edited by Brian Young or by Frank Panucci. It took me a few weeks to learn the software well enough to fly solo. Since this show, I have personally edited most of the musical performances on the show. That includes the video for The Appalachian Celtic Consort on this show. Host segments were shot around downtown Charleston in February 2007, and we had nothing to do with the building exploding at the end of the show. It was just a coincidence. You can read the original production notes here. We are frantically searching for episode 13, which seems to have gone missing. Once we get that one posted here, all of the early shows will be available online. 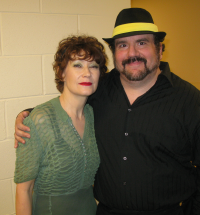 Three days after I saw it, Ann Magnuson’s “Back Home Again (Dreaming Of Charleston)” is still haunting my thoughts. To see such an amazing performance of such a well-thought-out show and on top of that to have the special connection to the material that only Charleston natives can have was a true honor. This show would have been compelling if I didn’t know the capital city like the back of my hand, but being from here made it unforgettable. I felt like I was part of the show simply by being in the audience. 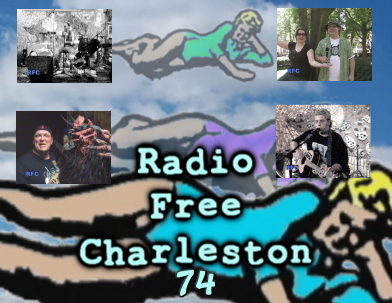 Radio Free Charleston’s seventy-fourth episode, “RFC Trax shirt” is online now! This show features music from Morgantown’s own, J Marinelli and Slate Dump, plus special announcements from Mad Man Pondo and Tofujitsu, as well as a Plant Ro Duction Mini Movie. We also continue the First Great Guitar Giveaway with Route 60 Music, which will kick off just as soon as we iron out the last technical bugs. As soon as we get the contest page working, the contest will run for one full month. Keep checking PopCult for updates. We’re working on it as fast as we can. Thanks for your patience. This is our first contest, and we’re learning as we go. Host segments and our end credit bed were shot last Saturday in Davis Park, during the “Art On A Stick” sale and open stage. You’ll hear RFC’s old buddy, Jerry Fugate, singing and playing Mandolin as we show you some of the sights of the day. Today we flash back to September 2007 with our “Back To School” episode. In this show, our host is knocked out and replaced by the then-twelve-years-old Cadence Young, who presents a short film by Audrey and Mia Beckner, music from Whistlepunk and Sean Richardson, and “Digitally Assaulted Charleston No. 1,” an animated short by Rudy Panucci. People have told me that the video for Sean’s “World Gone Mad,” which was a single shot with no edits or audio sweetening, recorded in the lobby at LiveMix Studios in one take, is one of the most compelling performances we’ve had on the show. Musically, this show captures a moment in the evolution of two beloved Charleston bands. Whistlepunk, having added Karen Allen, is shown as a four-piece band. Soon after this show, Sean Richardson, our other musical guest, joined the band. Since this time, Sean and Karen have split off to form Tofujitsu, while Whistlepunk is back to their three-piece format. Both bands are going strong, and played a pre-Valentine’s show together at LiveMix Studios (from where this show originates), along with Audrey and Mia’s dad, Stephen Beckner. You’ve seen performances from that night on recent episodes of RFC. Tofujitsu is planning a CD release show at Capitol Roasters on July 11. One week later they’ll be at The Empty Glass with Columbus’s Melty Melty and Scott Depot’s The Universes. You can read the original production notes here. Today’s late upload of our classic Radio Free Charleston is “Flaming Skull Shirt,” our twenty-fifth episode, and an example of kismet. Next week our seventy-fifth episode hits. That’s also our third anniversary. This show is being re-posted during FestivAll, and the end crredits feature Melanie Larch’s footage from FestivAll 2007. Plus the music played over the end credits is the song “The Trax” by Thre Bodies, which co-incidentally was the inspiration for the design on the shirt I’m wearing in RFC 74, which was just posted earlier today. The music in this one is a LiveMix performance by Joe Slack, and a vintage Danny-Boyd-directed video by The amazing Delores. You’ll also get to see the movie trailer for “Brokeback Coalmine” and our animation, which is a preview of Frank Panucci’s “Repurkussionz.” Original production notes are here. Our twenty-fourth episode, from August 2007, saw me going hatless, much to the distress of passers-by. Our music was from two cool young bands, InFormation and Seven Minutes Til Midnight. Since this episode originally aired, Seven Minutes Til Midnight have split up, with their bass player, Roy, winding up in InFormation. Plans are afoot to bring InFormation back to RFC, along with new projects from the other members of SMTM. We also feature the heavily-bleeped classic, “Cooking With The Atrocity,” and more cool animation from Frank. Original production notes can be found here.